A Pacman clone in C++, this was a school assignment. The ghosts has 3 behaviors : hunting, fleeing and scatter. When a ghost spawns it enters scatter mode. Scatter: It goes to a specific corner of the level. When the ghost has reached its destination it switches to hunting mode. Hunting: All the ghosts have different behaviors here. 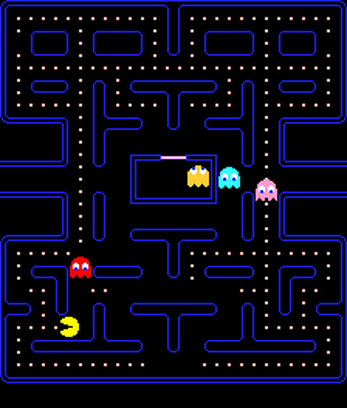 Blinky: Samples pacmans position and heads towards it. Pinky: Samples the intersection pacman is looking at and pathfinds to it, constructing a path around pacman. If Pinky is located at the intersection when sampling, she heads towards pacman. Inky: Switches between the other ghosts behaviors at random. 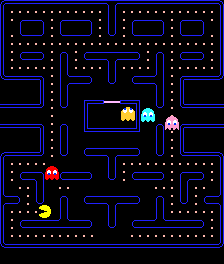 When pacman eats a pill the ghosts turn blue, and when the blue animation is over they switch to scatter mode. When a ghost has sampled a target for pathfinding, it does not update it again until it has reached its target. Extract the .zip and play the game. I can't start without msvcp140d.dll. That's a debug runtime library if I'm not mistaken. You probably had VS set to compile for debug, not release. I don't have VS installed, so I don't have the .dll, and I'm not too keen on downloading .dll's from shady sites, and I'm *really* not keen on dealing with an enormous VS installation for the sake of pacman. I'd like to play, but I can't. That fixed it. Nice job.